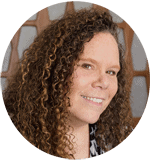 March 15, 2018 By This post may contain affiliate links. 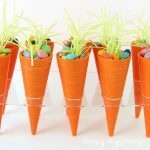 Fill these Carrot Candy Cups with your favorite Easter candies, like jelly beans or pastel M&M’s, then add sprigs of edible Easter grass to make these springtime treats look like they popped out of your garden. Every once in a while I find a tool that will help me make a unique food craft and I get so excited to share it with you. When I came across some plastic, cone shaped, dessert cups on Amazon, I immediately envisioned these Carrot Candy Cups in my mind and couldn’t wait to make them. The plastic, cone shaped, dessert cups come with display stands so you can fill the cones with a soft dessert, like mousse or pudding, and be able to set them upright for serving. I am eager to try that but I was most excited about creating these candy cups so as soon as the cups arrived I gave them a quick wash and got to work. I chose to use Orange Candy Melts instead of melted and tempered pure white chocolate that is colored orange for simplicity sake, but you can use either. I filled mine with Jelly Belly Jelly Beans and Pastel Easter M&M Candies in both milk and white chocolate. Any small candies or nuts will work. To make the Carrot Candy Cups all you have to do is paint Orange Candy Melts into the cup and allow it to harden into these carrot shaped treats. 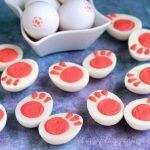 Before you know it you’ll have the entire display filled with these fun Carrot Candy Cups to serve for Easter dessert. Paint your cups using food use only paint brushes (brushes you only use for food). You’ll use about 2 ounces of melted candy melts to make each carrot candy cup. If you need instructions for melting candy melts see my Chocolate Making Tips page. Make sure you cover the entire interior of the cone shaped cup with candy melts. Allow the first layer of candy melts to harden before brushing on a second layer. Pop the cups in the freeze for 3-5 minutes then remove and allow to sit at room temperature for about 10 minutes before removing the candy from the plastic cup. If you allow them to chill for too long they might crack. Tug on the candy and slide it out of the cups. 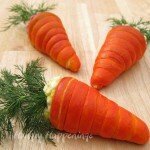 To make the carrots look a bit more realistic, drag a sharp knife over the surface to create some grooves. 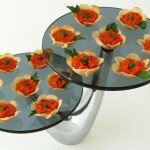 Arrange the Carrot Candy Cups in the display stand on the table where you plan to serve the desserts. 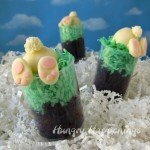 Fill the candy cups with Easter candies and add the edible Easter grass. The display stand will bow slightly in the middle so take care if you have to move the entire display of filled candy cups. You can also package the carrot candy cups in clear disposable pastry bags. You can find the supplies needed to make these Carrot Candy Cups from Amazon (commission earned for sales). 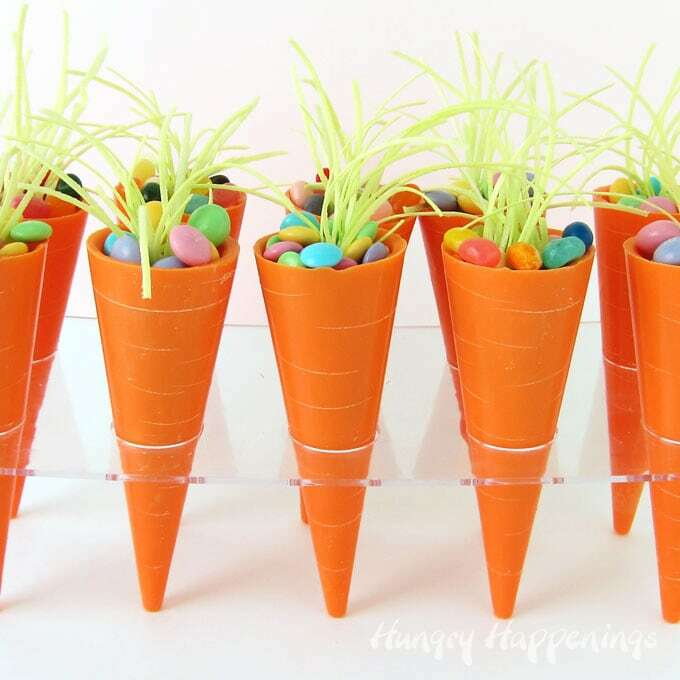 Orange cone shaped cups decorated to look like carrots are filled with Easter candy and displayed upright in a clear stand. Spoon about 2 tablespoons of orange candy melts into a cone shaped plastic dessert cup. Use a food use only paint brush to brush the candy melts all over the interior of the cup. Repeat coating all 10 cone shaped cups. Once the candy melts have hardened, brush on a second layer of orange candy melts. Pop the cups into the freezer for 3-5 minutes then remove and let sit at room temperature for about 10 minutes. Tug on the candy and slide the candy cones out of the plastic cups. Gently drag a sharp knife around the candy cups creating grooves to look like the grooves in a real carrot. Set the candy cups upright in the display stand. Fill the candy cups with Easter candies. Cut the edible Easter grass into 3 inch long pieces. Snuggle a small bunch of the edible grass in the middle of the candy in each candy cup so it looks like the greens on a real carrot. 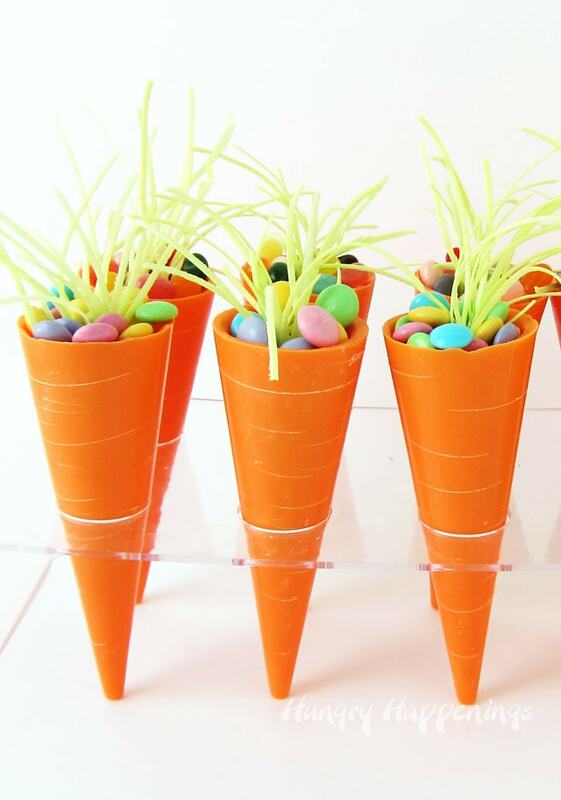 Will you make these Candy Carrot Cups for Easter? Let me know in the comments below. My mouth dropped open when I saw these carrot candy cups – completely over the top adorable! 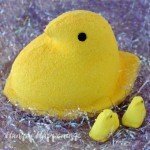 Another adorable Easter craft! 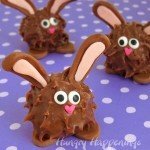 These look so fun and yummy. Hoppy Easter, Beth! Hoppy Easter to you too, Karen!!! I love this! I also wanted to let you know I selected your post as one of this week’s features on this Sunday’s Happiness is Homemade Linky Party. 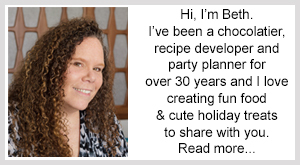 Be sure to check out this week’s party and my social media channels to see your feature. Thank you for stopping by the HIH party this week. Have an awesome week ahead! How did you make them so thick.? When I attempted the 2nd layer it melted the first layer! Help me!! If the candy melts are too hot then allow the orange candy melts to cool a bit before adding the second layer. If you are finding that the candy melts are getting too thick as they cool then you can add some Wilton Easy Thin (also known as paramount crystals) or a small bit of shortening or vegetable oil in order to thin it out.